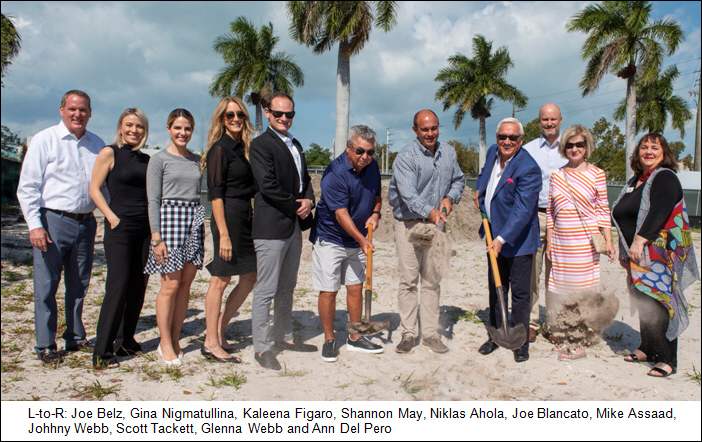 Groundbreaking Completed for SoCe Flats of Naples – Waterside Builders, Inc.
|Naples, FL – April 2019 / Newsmaker Alert / The principals of Collier County’s most respected developers, architects, interior design firms and real estate professionals came together recently for the official groundbreaking of their newest combined project, SoCe Flats (South of Central).Located at 101 Eighth Street South, four blocks from 5th Avenue South, SoCe Flats is a boutique mixed-use property that combines 18 condo-hotel residences and 4,200-square-feet of commercial space in downtown Olde Naples. Completion of construction and owner occupancy is expected in the summer of fall of 2020. With sales prices between $575,000 and $900,000, the residences have been approved for short-term rental. The project is the creation of the combined skills of Waterside Builders and MHK Architecture & Planning. Added Mike Assaad of Waterside Builders, “This property will reflect a luxurious, urban chic style preferred by today’s buyers. 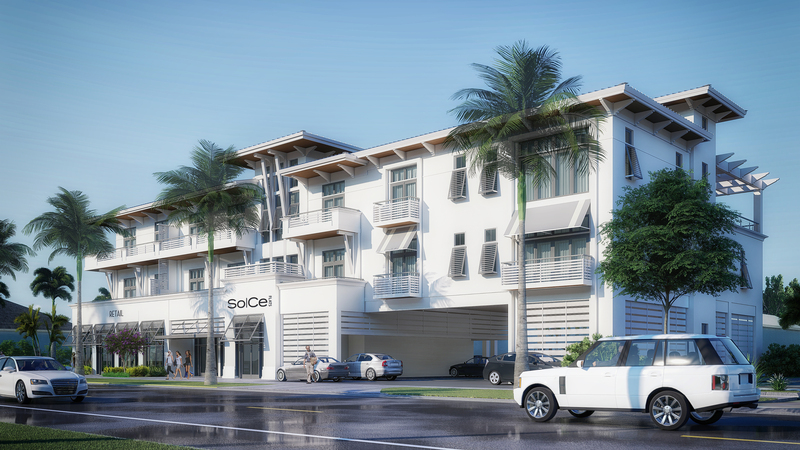 We are delighted to begin construction on this very exciting development in the heart of downtown Naples.”Joe Belz, a founding agent with Compass Naples, will guide the sales of SoCe Flats with partners Kaleena Figaro, Shannon May, Gina Nigmatullina and Nik Ahola.The first floor of SoCe Flats will feature commercial development and a lobby servicing the residents. The second and third floors will be dedicated to condos with an amenity area on the third floor. This high-tech building will include electric car charging and concierge services “on demand.”Clive Daniel Home Interior Designer Ann M. Del Pero, Allied ASID, IDS, CAPS is creating interiors for three diverse models for the residences. The one-bedroom, 676-square-foot plan will feature a Transitional Elegance design concept. The two-bedroom 867-square-foot plan highlights a Coastal Breeze design. The 880-square-foot one-bedroom/study residence will showcase a Modern Chic style. “Most condo hotels require that every unit is finished and furnished the same,” explained Belz. “Not this one. Buyers will have choices in flooring, cabinets, countertops, interior paint, and they can furnish as they desire. Pre-construction enables buyers to make their own color and finish selections. Ownership will provide buyers with a unique revenue-generating opportunity.”Prospective buyers are invited to take a custom-designed virtual presentation of interior finishing options while selecting wall colors, cabinet colors, countertops, and flooring to their own preferences. “Potential buyers will enjoy a clear vision of what their residence could look like when completed,” shared Belz. The SoCe Flats sales center is located next door to the project site at 201 8th Street South, Suite 106 and is open from 10 am to 4 pm Monday to Saturday or by appointment. Contact Joe Belz at 239-825-3646 for additional information. Located on the 2nd and 3rd floor of the SoCe Flats building, walk-ability to downtown shopping, dining and beaches is unparalleled. Natural finishes and clean lines blend urban design are paired with charming coastal architecture. Pre-construction provides the opportunity to make color and finish selections to your own style and taste. Furnishing packages will be available allowing a wide range of design styles. All hotel residences have been approved for short term rentals. What a unique property this will be; it will feel like home but generate rental revenue when you are away. Family and friends will be lining up for their turn to book their week! Pre-construction sales opportunities available now. Olde Naples living meets urban chic architecture! Developed by Waterside Builders and designed by MHK Architecture & Planning, SoCe Flats will be eighteen hotel residences and 4200 sq ft of commercial available now for reservation! Approved for short term rentals! Walk-ability to downtown and the beach as well as a unique revenue generating opportunity.